The most meaningful and moving sessions were those in which I didn’t plan what to talk about. Out of the unknown the amazing insights arose that Milan collected one by one, and which enabled me to see my way again. During the course of the sessions I went through significant changes in my life and eventually felt more at ease, quiet and open with myself. When I came for my first session with Milan I still wasn’t aware on the journey I was embarking on. And after that first session I did actually begin my journey: amazing, scary, moving, painful, easing and learning a lot. I met myself in so many places I didn’t dare to look before. During the sessions I experienced a whole new inner world that was not available to its extend before.  Milan’s ability to listen and create a meditative space enabled me to reclaim my strength which helped me through my crisis I experienced at work. Milan enabled me to feel my anger and also express it where needed and that was so important for me and so positive. I’m so grateful. Life presented a storm…and with Milan’s incredible help I developed tools invaluable to navigating my way through it. Working together has been a wonderful experience – at times hard but also beautiful. It’s been a deep learning process, which I continue to enjoy and draw on as more of life unravels! I contacted Milan in order to start couple’s therapy. Since the beginning of the sessions the connection with Milan was very honest, with respect and his extensive experience with working with couples was evident. The sessions where held in a safe environment were trust was built from the beginning. This process was powerful, I understood many aspects of relationships, love and authentic happiness. The workshop space enables me to say things differently, to better accept the other side, to truthfully see who is standing opposite me and is walking besides me in my life. Also to see my wishes, my needs, but also those of my partner – both of which are not always easy to expose. Suddenly there was room for an authentic communication between us. Milan will not give you advice what to do, he will not give you a set of techniques. He will guide you towards finding your own answers. The ones that are uniquely yours. And he will do it in a way that stays forever in your heart. When I came to the workshop everything seemed strange to me. On the one hand I wanted to connect to what was happening around me, but it also required me to trust a person I didn’t know to guide me. What Milan invited me to do, was to stay with what I felt and let myself sink into the process at my own rhythm. I began to listen inside to voices I had shut out for so many years. For me this process was the most amazing I ever participated in in my life. For me this process was moving, amazing and full of wisdom, sensitivity and love. Milan enabled me to start on a new path which I know won’t be easy, but this time with deeper roots that well support me. He connected between my heart and my mind, he made me understand my own feelings, to actually sense them, and to use them. He touched my soul. I have never felt in such a loving and supportive space as in this process. In every other place there are some kind of expectations, there is always some judgment. Only on my way home I began to realize how amazing the process had been. I came back to myself. All the moments of these 3 intense days lead to one place, to myself. All the exercises were built in ways that we knew that we wouldn’t get lost. And all this with a lot of love. Love from a therapist, where it’s clear that this is his passion, his place of doing what he loves, and to share this with us.